Due to lack of adequate number of formally trained nephrologists, many patients with chronic kidney disease (CKD) are seen by general practitioners (GPs). This study was designed to assess the knowledge of the GPs regarding identification of CKD and its risk factors, and evaluation and management of risk factors as well as complications of CKD. We conducted a cross-sectional survey of 232 randomly selected GPs from Karachi during 2011. Data were collected on a structured questionnaire based on the kidney disease outcomes and quality initiative recommendations on screening, diagnosis, and management of CKD. A total of 235 GPs were approached, and 232 consented to participate. Mean age was 38.5 ± 11.26 years; 56.5% were men. Most of the GPs knew the traditional risk factors for CKD, i.e., diabetes (88.4%) and hypertension (80%), but were less aware of other risk factors. Only 38% GPs were aware of estimated glomerular filtration rate in evaluation of patients with CKD. Only 61.6% GPs recognized CKD as a risk factor for cardiovascular disease. About 40% and 29% GPs knew the correct goal systolic and diastolic blood pressure, respectively. In all, 41% GPs did not know when to refer the patient to a nephrologist. Our survey identified specific gaps in knowledge and approach of GPs regarding diagnosis and management of CKD. Educational efforts are needed to increase awareness of clinical practice guidelines and recommendations for patients with CKD among GPs, which may improve management and clinical outcomes of this population. At present, there are only about 80 formally trained nephrologists in Pakistan for a population of about 160 million (the USA has more than 5000 nephrologists for a population of about 300 million). Until the public health services in Pakistan are developed further, general practitioners (GPs) will continue to be the frontline caregivers in Pakistan. Using the available evidence-based guidelines, the GPs should be able to detect, monitor, and treat CKD early in the course of the disease, thereby reducing mortality and improving quality of life for their patients. Currently, there has been no study in the region describing how the GPs are doing in incorporating these guidelines in their clinical practice. The current study was designed to assess the knowledge of GPs in detection and treatment of CKD and to see whether it is in accordance with the international guidelines for prevention, early detection, and management of CKD. We conducted a cross-sectional survey of the GPs practicing in Karachi to assess their knowledge and approach toward the diagnosis and management of CKD. Type of practice - location of clinic, duration of practice, affiliation with teaching hospitals, additional postgraduate qualifications beyond basic medical qualification (MBBS), and average number of patients seen per day. Detection of CKD and its risk factors such as diabetes, hypertension, old age, and family history of kidney disease. Screening for CKD - when to screen patients with type 1 and type 2 diabetes. Complications of CKD - CVD, hypertension, anemia, hyperparathyroidism, etc. Management goals in CKD - target systolic and diastolic blood pressure (BP), target glycated hemoglobin (HbA1c), target serum low-density lipoprotein (LDL) cholesterol, first-line antihypertensive therapy to control both BP and proteinuria, and antihypertensive agents routinely used in CKD. Referral to a nephrologist - at what level of glomerular filtration rate (GFR) a CKD patient should be referred to nephrologist. Source of information about CKD - medical journals and/or continued medical education (CME) activities. The questionnaire was validated by four consultant nephrologists. The questionnaire was pretested in a pilot study on 10 GPs and was finalized after necessary changes based on the feedback. Based on the assumptions that about 30% of GPs did not follow the standard guidelines for prevention, detection, and management of CKD, a total of 225 subjects were needed for the study. We anticipated a nonresponse rate of about 4%, so our required sample size was 234 GPs. We performed a cross-sectional survey of GPs practicing in Karachi during May to June 2011. Karachi is the largest and most cosmopolitan city in Pakistan, with a population of approximately 18 million. The city is divided into 18 administrative units known as towns. We obtained a comprehensive list of 5000 GPs practicing in Karachi from a medical database published in a book form called "The Mediguide." A computer-generated random sample of 234 GPs was selected from this list. The GPs surveyed had their practices in 12 of the 18 towns in the city and represented all socioeconomic classes. Each GP was visited by a trained research officer who administered the study questionnaire after obtaining written informed consent from the GP. Each GP was given 15-20 min to fill the questionnaire at the spot. In case the selected GP was not present, their replacement was chosen from the same area. The identity of the GPs was kept strictly confidential. All statistical analyses were conducted using the Statistical package for social science SPSS (Release 15.0, standard version, copyright© SPSS; 1989-02). A descriptive analysis was carried out for demographic characteristics and results, and presented as mean ± standard deviation. Frequencies and percentage were calculated for gender, teaching affiliation, and postgraduate qualifications. A total of 235 GPs were approached, and 232 consented to participate in the survey. Mean age of the GPs (±SD) was 38.5 years (±11.26). Of the study GPs, 132 (57%) were men. The average number of years since practicing as a GP was 12 (±10) years. The average number of patients seen by the GP per day was 57 (±67). A total of 61 (26.3%) GPs were affiliated with teaching hospitals and 71 GPs (30.6%) claimed to hold postgraduate qualifications beyond MBBS. A total of 205 (88.4%) GPs recognized diabetes to be a risk factor for CKD, and hypertension was identified as a risk factor by 185 GPs (79.7%). However, they were less likely to identify other risk factors for CKD, such as age older than 60 years (33.6%) and family history of kidney disease (42.2%). When questioned about as to when to screen patients with type 1 diabetes for kidney disease, only 29 GPs (12.5%) answered correctly. However, most of them (77.2%) knew as to when to screen type 2 diabetics. The participants were asked to identify the best method to estimate kidney function. Serum creatinine was the most common choice (78.1%), followed by 24 h urine collection for creatinine clearance (63.8%). Estimated glomerular filtration rate (eGFR) using a mathematical formula was chosen by only 58 GPs (37.9%). When asked what conditions were complications of CKD, most GPs (83.2%) recognized anemia as a complication. Bone disease and secondary hyperparathyroidism were identified by 53.4% only and malnutrition by 47.8% GPs. 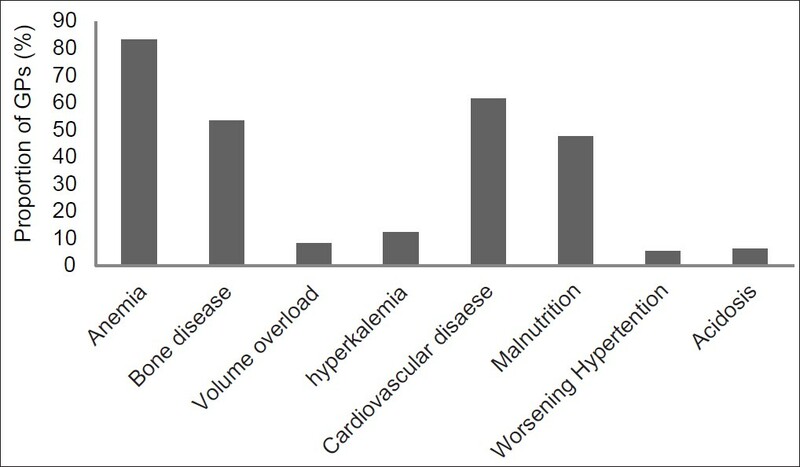 Other complications such as volume overload, hyperkalemia, metabolic acidosis, and worsening hypertension were considered by very few of them [Figure 1]. Only 61.6% GPs recognized CKD as a risk factor for CVD. 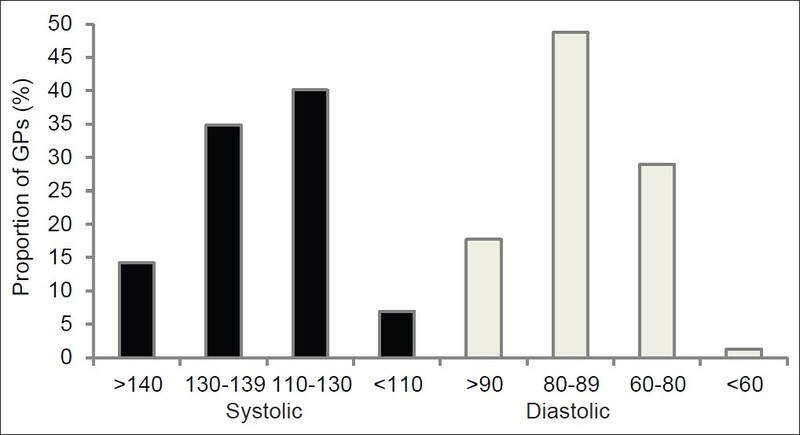 The correct levels of target systolic and diastolic BP in CKD patients were aimed for by only 93 (40.1%) and 67 GPs (28.9%), respectively [Figure 2]. Only 107 (46.1%) GPs chose Angiotensin converting enzyme inhibitors (ACE) or angiotensin receptor blockers (ARBs) when questioned about the first-line therapy to control both BP and proteinuria in order to slow down the progression of CKD. The correct target HbA1c in patients with diabetes and CKD was aimed for by 124 GPs (53.4%). However, only 50 GPs (21.6%) were aware of the correct level of target LDL cholesterol in CKD patients. There was uncertainty among the GPs about when to refer to a nephrologist. An estimated GFR of 30-60 ml/min was chosen by 23.3% GPs, 15-29 ml/min by 19.8%, and less than 15 ml/min by 15.1% GPs, whereas 40.9% GPs responded that they did not know when to refer the patient to a nephrologist. Only half the GPs reported reading medical journals in order to keep themselves updated, whereas approximately 33% GPs claimed to participate in CME activities held at various tertiary care hospitals. The results of our GP survey highlight the areas that need to be worked upon in order to improve the quality of care and outcomes for patients with CKD. In Pakistan, patients suffering from CKD are mainly under care of internists and GPs until they reach advanced kidney failure when they are referred to a nephrologist. Delayed referral of CKD patients to a nephrologist has been identified as an important predictor of poor outcomes. In order to initiate timely referral of CKD patients, primary care providers and family physicians need to be aware of risk factors for CKD, screening methods, as well as comorbid conditions and complications associated with CKD. In addition, they should be aware of the clinical practice guidelines describing optimal care of patients with CKD. The NKF's KDOQI work-group released evidence-based guidelines, in 2002, to increase awareness of these secondary prevention strategies in the care of CKD. These are the only known evidence-based guidelines for pre-dialysis CKD care. Incorporation of these guidelines into clinical practice facilitates early detection of CKD by primary care providers and identification and management of its complications, and promotes timely referral of patients to nephrology services. Traditionally, physicians have been relying on measurement of serum creatinine alone for detection of kidney disease. The KDOQI guidelines recommend that serum creatinine alone is not an accurate index of the level of GFR and that the level of GFR should be estimated from prediction equations that take into account the serum creatinine concentration and some or all of the following variables: Age, gender, race, and body size. Our results indicate that only 38% physicians opt for eGFR for detection of CKD and most of the GPs preferred serum creatinine and/or 24 h urine collection for creatinine clearance. A study involving 10 primary care providers from New York showed similar findings as far as physicians' preferences for kidney disease diagnostic tests were concerned. Only one of the physicians interviewed reported using eGFR,  whereas the rest of them relied upon blood urea, serum creatinine, or urinalysis for diagnosis of CKD. Results from a cross-sectional study, based upon different groups of physicians at a tertiary care hospital in Pakistan, showed that majority of the study subjects (78%) were aware of eGFR being a better way of assessing severity of kidney disease than elevated serum creatinine alone. Using serum creatinine alone may result in significant under-recognition of CKD as the level may still be within normal range even when kidney function is significantly impaired. Measurement of creatinine clearance requires collection of a timed urine sample, which is inconvenient and frequently inaccurate. In order to identify patients with early CKD, estimation of GFR using formulae such as the Cockcroft-Gault and modification of diet in renal disease should be done. Epidemiologic studies show an increased risk for CKD among individuals with certain clinical and sociodemographic characteristics, including older age, race (African-Americans), diabetes, hypertension, autoimmune diseases, urinary tract infections, stone disease, neoplasia, family history of CKD, etc. It cannot be overemphasized that prevention of adverse outcomes of CKD could be facilitated by evaluating individuals with these risk factors to enable earlier detection and intervention. In our survey, diabetes and hypertension were identified as risk factors for CKD by most of the physicians, whereas other risk factors for CKD such as age older than 60 years and family history of kidney disease did not receive the same recognition. Data from a web-based survey in the USA, which included 376 family medicine and internal medicine trainees, show similar results. Whereas almost all physicians identified diabetes and hypertension as strong risk factors for CKD, minority status, old age, or family history were not universally recognized. The authors speculated that it would be more challenging to emphasize the contribution of risk factors such as race, ethnicity, and old age, because of the varying prevalence of comorbid diseases such as hypertension. The American Diabetes Association and the KDOQI work-group recommend that patients with diabetes should be screened annually for diabetic kidney disease. Initial screening should commence 5 years after the diagnosis of type 1 diabetes and at the time of diagnosis of type 2 diabetes. It is disappointing that almost 88% of the GPs surveyed do not know as to when to start screening type 1 diabetics for the presence of kidney disease. However, most of the physicians were aware of screening patients with type 2 diabetes, which is the more prevalent form of the disease. As far as management of diabetic patients with CKD was concerned, only half the GPs identified the correct target HbA1c. It is of particular concern because diabetes is the leading cause of kidney failure worldwide, and the prevalence is high in the South Asian populations and is expected to increase two-fold between 2000 and 2030. Appropriate screening, early detection, and timely intervention including management of diabetes and hypertension are the only strategies that can slow kidney disease progression and reduce cardiovascular risk. In 2007, the KDOQI work-group released evidence-based clinical practice guidelines and clinical practice recommendations for screening and management of patients with diabetes and CKD. A vast majority of patients with diabetes and kidney disease are under care of GPs in our part of the world owing to huge burden of the disease and lack of adequate number of nephrologists. Hence it needs to be ensured that our GPs are well versed in detection and management of diabetes and diabetic kidney disease. Physicians involved in the care of CKD patients should pay attention to a wide range of disorders that may develop as a consequence of the loss of renal function. These include disorders of fluid and electrolyte balance, such as volume overload, hyperkalemia, metabolic acidosis, and hyperphosphatemia, as well as abnormalities related to hormonal or systemic dysfunction, such as anorexia, nausea, vomiting, fatigue, hypertension, anemia, malnutrition, hyperlipidemia, and bone disease. Onset and severity of these complications are related to the level of GFR. Below a GFR of approximately 60 ml/min, there is a higher prevalence of abnormalities of bone metabolism, anemia, malnutrition, and hypoalbuminemia. Other complications such as volume overload, hyperkalemia, and metabolic acidosis tend to occur when GFR falls below 15-20 ml/min. Our results showed that most of the GPs recognized anemia, whereas bone disease and secondary hyperparathyroidism, as well as malnutrition, were identified as complications by only half of them. It is important to recognize these disorders as complications of CKD in order to reduce disease-related morbidity and mortality. The KDOQI guidelines recommend ACE inhibitors and ARBs as the preferred agents for diabetic kidney disease and non-diabetic kidney diseases with proteinuria. In these diseases, they lower BP, reduce proteinuria, slow the progression of kidney disease, and likely reduce CVD risk by mechanisms in addition to lowering BP. There is substantial amount of evidence suggesting efficacy of this class of drugs in decreasing albuminuria, and delaying the progression from microalbuminuria to macroalbuminuria in patients with proteinuria and CKD. ,, Almost half the GPs chose ACE inhibitors or ARBs as the first line of treatment to control BP and proteinuria followed by calcium channel blockers (34.9%), beta blockers (31%), and thiazide diuretics (29.7%). It is noteworthy that the GPs' survey from Pakistan mentioned earlier had revealed that almost 45% of GPs used sedatives either alone or in combination with other antihypertensive agents as first-line therapy for hypertension. Keeping these observations in view, our survey indicates an improvement in prescribing practices of GPs as far as the management of hypertension is concerned. All patients with a progressive increase in serum creatinine level need referral to a nephrologist, and preparation for renal replacement therapy ideally requires frequent contact with a nephrologist over at least a year. Compared with early referral, late referral has been found to be associated with a significantly increased risk of morbidity as well as all-cause mortality. The potential benefits associated with early referral include informed selection of dialysis modality, timely placement of appropriate dialysis access, non-emergent initiation of dialysis, lower morbidity and improved rehabilitation, less frequent and shorter hospital stays, lower cost, improved survival, and likelihood of preemptive transplant. In addition, timely referral provides opportunities for appropriate intervention that would eventually slow down the progression of CKD as well as reduce CVD risk. The KDOQI guidelines recommend that patients with CKD should be referred to a nephrologist when the eGFR is less than 60 ml/min. In our survey, we found an uncertainty among our GPs about the appropriate time of referral. A vast majority of GPs were not aware as to when to refer a CKD patient to a nephrologist. Only 23% chose to refer when GFR was below 60 ml/min. Data from the USA and other developed as well as developing countries suggest that late referrals are quite common. One study has shown that approximately 25-50% of patients beginning chronic renal replacement therapy in the USA require dialysis within 1 month of their first nephrology visit. In another study from Pakistan, almost half (48%) the study subjects were found to be unaware as to when to refer these patients to nephrologists based on eGFR, although a vast majority (84%) of the physicians knew that late referral would result in complications and higher morbidity and mortality. Timely referrals to nephrologists can only be made when the primary care providers have a better understanding of the eGFR, including the level of GFR at which referral is recommended. Our findings emphasize the need to increase the GPs' awareness and knowledge of the evidence-based CKD care as outlined in KDOQI guidelines. There is a need for continually updating the medical schools' curricula as well as having structured and more frequent CME activities at teaching hospitals, especially targeting the GPs. In addition, knowledge regarding CKD can be improved by the use of posters and leaflets displayed in hospitals as well as by using the print (newspapers and journals) and the electronic media (radio and television). The KDOQI guidelines are quite extensive (over 200 pages) and hence are cumbersome to read. The responsibility lays with the physicians at the teaching hospitals, especially the nephrology community, to summarize the KDOQI guidelines into a one-page educational tool providing the key evidence-based practical points of the guidelines so that the GPs as well as other physicians involved in care of CKD patients could actually put them into practice. 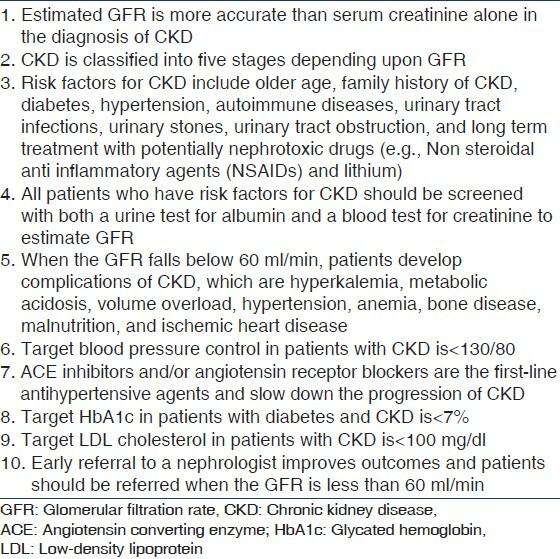 The key points that will help the GPs and internists improve their diagnosis and management of CKD are summarized in [Table 1]. We noticed in our survey that most GPs were not aware of using eGFR to diagnose CKD. One simple solution could be requesting the laboratories to automatically report the eGFR (without an extra charge) whenever a serum creatinine is ordered. This is the current practice in most of the developed countries. However, physicians should be aware that GFR is influenced by age, gender, and race. The benefit of this study has a wider scope as updating the knowledge of GPs would lead to appropriate and timely diagnosis and management of patients with CKD. Furthermore, the limitations in knowledge and practice patterns of GPs will be communicated to the health authorities concerned with formulating appropriate recommendations for GPs, and thus they would be educated and quality of care to the community would be improved. The limitations of our study are the small sample size and that the study was restricted to the GPs practicing in Karachi. Thus, it is not representative of GPs in other cities of the country, especially remote rural areas. A broader national survey would be needed to test the generalizability of our results. Another limitation could be the questionnaire that was kept short to ensure less time consumption while filling it. Thus, there were a few questions testing each aspect of CKD evaluation and management and this may less accurately evaluate the level of knowledge. One should be aware that our study was designed to assess mainly the knowledge of GPs regarding diagnosis and care of patients with CKD. Hence, we cannot determine as to whether the proportion of GPs, who claimed to aim for correct diagnostic tools and management targets, would actually set those targets and practice them while treating those patients in real life. Also, we cannot determine the proportion of subjects who actually achieved those targets. Our survey highlights the deficiencies and gaps in the knowledge and practices of GPs in Karachi regarding diagnosis and management of CKD. Educational efforts are needed to increase awareness of clinical practice guidelines and recommendations for patients with CKD among GPs, which may improve management and clinical outcomes of this population. 1. Coresh J, Selvin E, Stevens LA, Manzi J, Kusek JW, Eggers P, et al. Prevalence of chronic kidney disease in the United States. JAMA 2007;298:2038-47. 2. Snyder JJ, Foley RN, Collins AJ. Prevalence of CKD in the United States: A sensitivity analysis using the National Health and Nutrition Examination Survey (NHANES) 1999-2004. Am J Kidney Dis 2009;53:218-28. 3. Sarnak MJ, Levey AS, Schoolwerth AC, Coresh J, Culleton B, Hamm LL, et al. Kidney disease as a risk factor for development of cardiovascular disease: A statement from the American Heart Association Councils on Kidney in Cardiovascular Disease, High Blood Pressure Research, Clinical Cardiology, and Epidemiology and Prevention. Circulation 2003;108:2154-69. 4. Johnson DW. Evidence-based guide to slowing the progression of early renal insufficiency. Intern Med J 2004;34:50-7. 5. Snively CS, Gutierrez C. Chronic kidney disease: Prevention and treatment of common complications. Am Fam Physician 2004;70:1921-8. 6. Sakhuja V, Sud K. End-stage renal disease in India and Pakistan: Burden of disease and management issues. Kidney Int Suppl 2003;83:S115-8. 7. Jafar TH. The growing burden of chronic kidney disease in Pakistan. N Engl J Med 2006;354:995-7. 8. K/DOQI clinical practice guidelines for chronic kidney disease: Evaluation, classification, and stratification. Am J Kidney Dis 2002;39:S1-266. 9. Chan MR, Dall AT, Fletcher KE, Lu N, Trivedi H. Outcomes in patients with chronic kidney disease referred late to nephrologists: A meta-analysis. Am J Med 2007;120:1063-70. 10. Fox CH, Brooks A, Zayas LE, McClellan W, Murray B. Primary care physicians' knowledge and practice patterns in the treatment of chronic kidney disease: An Upstate New York Practice-based Research Network (UNYNET) study. J Am Board Fam Med 2006;19:54-61. 11. Tamizuddin S, Ahmed W. Knowledge, attitude and practices regarding chronic kidney disease and estimated GFR in a tertiary care hospital in Pakistan. J Pak Med Assoc 2010;60:342-6. 12. Lenz O, Fornoni A. Chronic kidney disease care delivered by US family medicine and internal medicine trainees: Results from an online survey. BMC Med 2006;4:30. 13. KDOQI. KDOQI clinical practice guidelines and clinical practice recommendations for diabetes and chronic kidney disease. Am J Kidney Dis 2007;49:S12-154. 14. Wild S, Roglic G, Green A, Sicree R, King H. Global prevalence of diabetes: Estimates for the year 2000 and projections for 2030. Diabetes Care 2004;27:1047-53. 15. Jafar TH, Stark PC, Schmid CH, Landa M, Maschio G, de Jong PE, et al. Progression of chronic kidney disease: The role of blood pressure control, proteinuria, and angiotensin-converting enzyme inhibition: A patient-level meta-analysis. Ann Intern Med 2003;139:244-52. 16. Kidney Disease Outcomes Quality Initiative (K/DOQI). K/DOQI clinical practice guidelines on hypertension and antihypertensive agents in chronic kidney disease. Am J Kidney Dis 2004;43:S1-290. 17. Jafar TH, Jessani S, Jafary FH, Ishaq M, Orakzai R, Orakzai S, et al. General practitioners' approach to hypertension in urban Pakistan: Disturbing trends in practice. Circulation 2005;111:1278-83. 18. Effects of ramipril on cardiovascular and microvascular outcomes in people with diabetes mellitus: Results of the HOPE study and MICRO-HOPE substudy. Heart Outcomes Prevention Evaluation Study Investigators. Lancet 2000;355:253-9. 19. Brenner BM, Cooper ME, de Zeeuw D, Keane WF, Mitch WE, Parving HH, et al. Effects of losartan on renal and cardiovascular outcomes in patients with type 2 diabetes and nephropathy. N Engl J Med 2001;345:861-9. 20. Jafar TH, Schmid CH, Landa M, Giatras I, Toto R, Remuzzi G, et al. Angiotensin-converting enzyme inhibitors and progression of nondiabetic renal disease. A meta-analysis of patient-level data. Ann Intern Med 2001;135:73-87. 21. Kazmi WH, Obrador GT, Khan SS, Pereira BJ, Kausz AT. Late nephrology referral and mortality among patients with end-stage renal disease: A propensity score analysis. Nephrol Dial Transplant 2004;19:1808-14.